Murals are a wonderful way to express important environmental issues through art. Our Project EduBat muralexplores the importance of bats to people and the environment across the country. 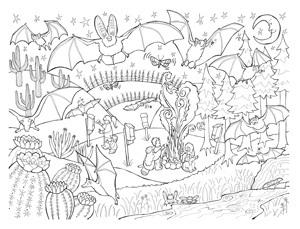 Starting with our eastern forests traveling through the agricultural lands of the Midwest and ending in our southwestern deserts, this mural explores the various ways that bats are woven into our lives. The mural consists of 25 individual sheets that can be printed on separate 8 ½ x 11” sheets of paper. CLICK HERE for each sheet that can be colored by one or more students, cut out, and then put together with the other sheets to tell a wonderful story. CLICK HERE for the EduBat Mural Key. Use this illustration to help you determine where each of the 25 individual coloring sheets should be placed in your completed mural. CLICK HERE for the Teacher’s Guide to the Project EduBat Mural. Use this quick guide to help transform this fun activity into an educational one. Explore the wonders of our North American bats and why they are so important to us! CLICK HERE for a low resolution pdf of a poster,Working the Night Shift - Why study bats and what methods can we use? The poster is 40 x 30 inches. 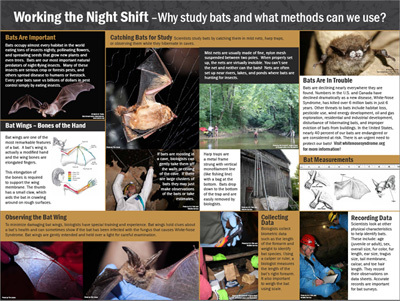 CLICK HERE for a high resolution pdf of a poster, Working the Night Shift - Why study bats and what methods can we use? The poster is 40 x 30 inches. CLICK HERE for the poster that can be printed on separate 8 ½ x 11” sheets of paper. CLICK HERE for a pdf of a poster about White-Nose Syndrome (WNS). White-Nose Syndrome is a devastating disease that has killed over 6 million bats in 6 years as they hibernate in caves and mines. This poster can be used as a stand-alone tool at festivals and fairs or incorporated into any of the Project EduBat activities dealing with WNS. The poster is 36 X 24 inches. CLICK HERE for a low resolution pdf of a poster, EduBat – Education Taking Flight. The poster is 36 X 72 inches. CLICK HERE for a high resolution pdf of a poster, EduBat – Education Taking Flight. The poster is 36 X 72 inches.